Eight months after the wildly popular release of avast! Free Mobile Security, we are pleased to launch avast! Mobile Security 2.0 for Android smartphones and tablets. Adding to its already feature-rich anti-malware and anti-theft capabilities, the latest version of avast! Mobile Security 2.0 is sure to be the best free security solution for Android on the market. You can download it from the Google Play store. “The free-but-full-featured Android antivirus and anti-theft app has become the highest-rated security solution on Google Play store with a score of 4.7 stars,” said Ondřej Vlček, CTO of AVAST Software. “We protect over 8 million active devices now and we are growing by 1 million active devices per month,” added Vlček. avast! Mobile Security 2.0 uses the same award-winning antivirus engine as avast! Antivirus products for PC and Mac and is constantly updated with a mobile version of our virus database and latest virus definitions. avast! Mobile Security 2.0 seamlessly integrates the most stealthy anti-theft component in the marketplace: Immediately upon detecting a threat, avast! Anti-Theft jumps into action without alerting thieves to its presence. Remote functions through the web portal - allows you to remotely control your avast!-equipped device(s) from the web. The web portal offers full control of the device to remotely locate, lock, or wipe your lost phone, sound an alarm, SMS and call forwarding, and a lot more. Access the interface on my.avast.com. Improved tablet support - with the popularity of Android tablets such as Amazon’s Kindle Fire and the Samsung Galaxy Tab, AVAST has worked to provide better compatibility with these devices, along with delivering a specific user interface tailored for the larger tablet devices. Network meter - review your data usage consumed by each app, individually for WiFi, 3G, or roaming networks. avast! 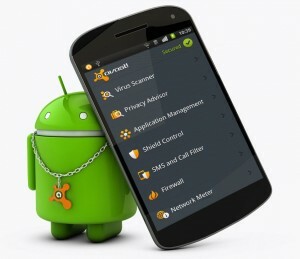 Widget - from your device screen, the avast! Widget provides you a quick view of your overall security status, and the ability with one tap to access the main avast! Free Mobile Security interface, to run a malware scan of your installed apps, or bring up a dashboard of device health information such as CPU usage, memory usage, and SD Card free space. SiteCorrect™ - in a new feature unique to AVAST, our web protection will now detect common URL typing mistakes and can redirect you to the site you intended to visit. “We’ve now made the avast! Mobile Security product even better, and continue to keep the solution totally free,” commented Vince Steckler, CEO of AVAST Software.